Ice is causing disruption on roads across Wales as temperatures remain around freezing or below. The Met Office has issued a severe weather warning about icy roads and is urging motorists to take extra care. Dyfed-Powys Police is warning motorists about ice throughout its force area, however Gwent Police said roads in its area were clear. Some 440 schools have announced they will be fully or partially closed on Thursday. Many roads were still closed on Thursday morning including the Bwlch, Rhigos and Maerdy mountain roads in the south Wales valleys. If you are fed up with the snow, I've got some good news - we are not expecting much if any fresh snow over the next few days. It is going to turn less cold if not milder with a thaw. Some rain and strong winds are on the way as well and, because the ground is so cold, there is still a risk of ice. The rest of Thursday looks fairly quiet - cloudy with some mist and fog patches. The odd spot of drizzle but otherwise dry with the best of the sunshine in parts of north Wales. There are likely to be mist and fog patches on Thursday night and a continuing risk of ice, especially in central and north-east Wales, and on higher-level roads. After midnight, the wind will freshen with rain later in the night. A few centimetres of snow are likely on higher ground but it will be transient. On Friday morning we can expect cloudy and breezy weather with outbreaks of rain and drizzle. There are also road closures in Ceredigion including the A4120 at Ponterwyd, the A486 between Synod Inn and Ffostrasol and the A4120 between Pisgah and Trisant Junction. The A4086 at Nant Peris in Gwynedd had been shut due to hazardous driving conditions between Market Street in Llanberis but later reopened. 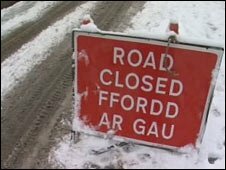 Other roads still closed include the A542 Horseshoe Pass in Denbighshire and the A543 at Pentrefoelas, Conwy. Some B-roads are shut in areas including Powys, Gwynedd, Conwy and Ceredigion. Bus routes were also affected with operator Stagecoach reporting the cancellation or disruption of some services in the south Wales valleys. Many schools in Blaenau Gwent, Merthyr Tydfil and Torfaen are closed again on Thursday. All 90 schools in Caerphilly were fully or partially shut - except to pupils sitting exams - while more than 130 schools were affected in Rhondda Cynon Taf. Rhondda Cynon Taf council (RCT) said it had again been forced to cancel its school transport service but was working to help pupils with exams. RCT council said it was working with schools to provide emergency transport, especially for pupils who had examinations this week. Officers and councillors who have 4x4 vehicles have been offering to help students get to school and college. Assembly member Leanne Wood this week raised concerns about the impact of school closures on working parents during the big freeze. She has written to Wales' Education Minister Leighton Andrews to ask whether he intends asking councils to plan "alternative provision" for pupils in bad weather. First Minister Carwyn Jones said head teachers and governors of schools were being urged to keep schools open as far as possible, but they would have to make decisions based on local circumstances. The WJEC exam board has continued with exams that will count towards pupils' GCSEs and A-levels. Pupils in Merthyr sat their exams at a leisure centre after all four secondary schools were shut due to the weather. Meanwhile, a Torfaen council workman helped clear frozen roads of ice within hours of his partner giving birth. Ryan Nightingale, 30, took to the streets hours after his partner Kelly Johnson's waters broke and again after she gave birth to their second son, Brooklyn, on 28 December. Torfaen council said it was no longer replenishing grit bins after reports that people in large vehicles or vans were emptying grit bins within minutes of them being filled. BBC Wales weather forecaster Derek Brockway said ice would be a problem on Thursday morning but there was also a risk of mist and fog. Many areas are expected to be grey and misty but the sun may break through in places. Mr Brockway said there could be a few showers, mostly rain, in north Wales but it would otherwise be largely dry. Friday is expected to be less cold and, after a little rain, it will be dry and brighten up. Ffos Las racecourse said Sunday's National Hunt meeting at the venue would go ahead as scheduled following a track inspection held at 0800 GMT on Thursday.